While much has been written about the minds and methods of the medical professionals who save our lives, precious little has been said about their emotions. inicians and patients, understanding what doctors feel can make all the difference in giving and getting the best medical care. Digging deep into the lives of doctors, Dr. Danielle Ofri examines the daunting range of emotions—shame, anger, empathy, frustration, hope, pride, occasionally despair, and sometimes even love—that permeate the contemporary doctor-patient connection. 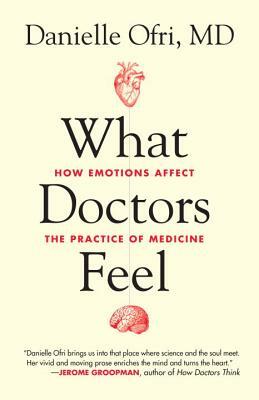 Drawing on scientific studies, including some surprising research, Dr. Ofri offers up an unflinching look at the impact of emotions on health care. Dr. Ofri takes us into the swirling heart of patient care, telling stories of caregivers caught up and occasionally torn down by the whirlwind life of doctoring. She admits to the humiliation of an error that nearly killed one of her patients. She mourns when a beloved patient is denied a heart transplant. She tells the riveting stories of an intern traumatized when she is forced to let a newborn die in her arms, and of a doctor whose daily glass of wine to handle the frustrations of the ER escalates into a destructive addiction. Ofri also reveals that doctors cope through gallows humor, find hope in impossible situations, and surrender to ecstatic happiness when they triumph over illness. Danielle Ofri, MD, PhD, is an associate professor of medicine at the New York University School of Medicine and has cared for patients at New York’s Bellevue Hospital for more than two decades. Ofri’s books and articles have become academic staples in medical schools, universities and residency programs. She is the editor in chief of the Bellevue Literary Review and writes regularly for the New York Times.